Fated exists as a road leading to a dead end, a journey with no arguable purpose. 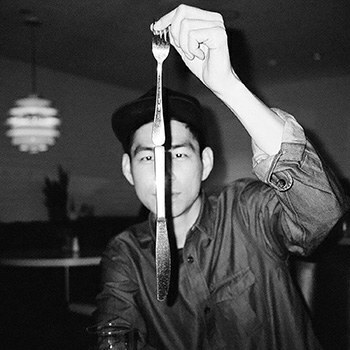 Out of everything Nosaj Thing could be hoping to do with his own brand of glitch-hop, one possibility has always seemed likeliest to me- perhaps it is music intent on generating rich imagery. While Jason Chung’s debut Drift possessed the aesthetic of a dilapidated carnival, neon lights blinking in and out of existence under the muted glow of moonlight, Home took the opposite direction by demanding a comfortable experience of the listener. One record took us down a dark alleyway, insisting we placed our trust in it; the other carried us away from harm and into warm swathes of light. Fated is harder to dissect because it is a naturally ambiguous album, one defined, if nothing more, by its sheer repression. “Sci” establishes an unnerving atmosphere only to relish in it for too long- things are dreary from the start of this record, to be sure. If the song were one of the only ones to drag its feet on the way out then this would be pardonable, but few of the tracks here seem to have a discernible purpose within the overall album’s framework. The essence of Fated often works against itself, for its emotionally ambiguous nature grows wearisome quickly enough. It’s not necessarily a problem that many of the songs on this record exist rather formlessly, only lasting around two minutes and then promptly departing- J. Dilla himself proved this kind of format can be done exceedingly well- but he did it well because his music still felt vital, and would have regardless of the format. To be fair, Nosaj has done well with shorter song schemas in the past. Tunes like “Prelude” worked because they provided solace from the more clearly structured parts of the album. Fated is an album comprised of songs that feel meant to hold other, more developed, songs together. It exists as a road leading to a dead end, a journey with no arguable purpose. The cover of this album seems to imply Fated is the record where Chung makes music that says more about him than his previous ones, with him directly in the spotlight- but in order for that to be the case, the album needs to say something from the get-go. Fated whispers ideas every now and then, but seems to lack the confidence to go any further. At this point, I should probably clarify my high standards for Nosaj Thing. It would be an incredibly difficult feat for Chung to put to record what he seems to have so easily captured in his live KSKW set back in 2010- the cathartic and frenetic end result of what was deemed an improvised live set. It isn’t meant as an insult that I feel none of Nosaj Thing’s recorded albums have adequately captured the essence of their creator- the difference is just so unavoidably there. the producer’s albums have often come across as more emotionally indistinct, like hazy outlines of cargo ships illuminated on a distant shoreline- the feelings are still there, but they’re harder to grasp if you don’t know what you’re looking for. I’ve always attempted to see Nosaj Thing's albums as a personal challenge to fully grasp, a chance for me to further understand why exactly it is that the process of recording promising music can occasionally dilute its meaning to vaguer platitudes. When Chung’s songs were first written, they must’ve stood out from all the melodies that surrounded them. They must have given the impression that they were significant and needed to be captured in some way, like a photographer witnessing something unquestionably beautiful with just enough time to capture a decent shot. I have no doubt that Fated was a great record on paper- meant to capture the emotional blankness of ‘70s sci-fi, its description at least sounds like something that I’d love to hear pulled off. But something special about music is often lost in the space of the recording studio- namely the spontaneity of an artist problem-solving under limited circumstances. And this skill is something that, under the right circumstances, Jason Chung clearly possesses- and can imaginably, once again, tap into.